Inder Loves Folk Art: Dolly. When I was a little girl, my grandmother, whom I called Nanny, and Maggie's namesake (her name was Wendy Joy), made me a little rag-doll using some printed yardage. Her face was printed on the fabric, but Nanny embelished it with embroidery and lace and special little details. I named her "Vicky" (it was the 80s!) and slept with her every night. 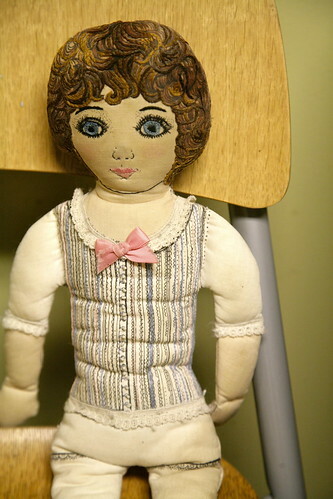 Nanny loved to make dolls and made me many dolls, most of them fancier than Vicky. I loved those dolls too, but Vicky was my #1 doll. Sometimes simple is best! Originally, she had extra bloomers, a petticoat, an underdress, and a dress and pinafore, all circa 1900. My grandmother was a stickler for historical detail, but she made sure all of the clothes came off easily, even with chubby toddler fingers. Over the years, I lost all of her clothes, so now she's permanently in her "unmentionables." 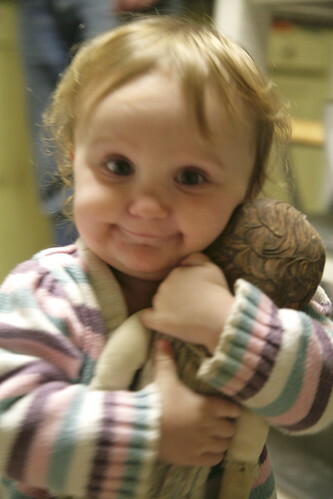 But I always held onto my #1 doll. My beloved Nanny passed away many years ago, and I kept Dolly to remind me of her. 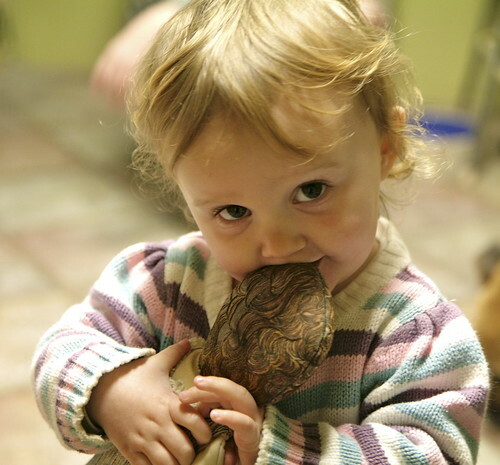 Unlike Joe, who reserves his nurturing instincts for construction vehicles and Angry Birds masks, Maggie actually seems to like stuffed animals and dolls? So, on a whim, I brought Vicky downstairs last night. And this is what happened, without any prompting. My heart was so busy exploding into a million tiny pieces that Steve had to prompt me to "Get the camera!" Oh wow. I think I will be sewing Dolly a new wardrobe this Christmas. This may be more cuteness than the internet can bear. What a lovely story! Vicky is very special - and Maggie is just adorable. Handmade Christmas - Status Report. Art Museum Trousers. And yucky stuff.